People in high places and in influential government positions are dying, but they aren't dead after all(?). What's the deal? "I don't care what you say, bacon doesn't belong in cookies. Chocolate-covered and bacon macaroons? Not in this mouth, Sam, not in this mouth," said Inspector Kant. "Get a grip," Dillard, "said Lieutenant Sam Tillman, "everybody is mixing everything now days. I had fried mushrooms with a sour-cream and peanut butter dip on spinach and cornmeal chips last weekend. It was at my sister’s birthday party and it was great. If I can try that then you can taste this macaroon." Inspector Kant made the sign of the cross, using his two forefingers, and directed it toward Lieutenant Tillman; then he said, "Get thee behind me Satan; I shall not eat your forbidden fruit!" "OK," replied Lieutenant Tillman, "but I got to tell you, you don't know what you’re missing." At that moment the Captain came out of his office and walked over to the two men. He saw the cookies and popped one in his mouth, then said after chewing for awhile, "Chocolate-covered bacon macaroons. Aren't they great? My wife makes them, but she adds onion and garlic." After taking another cookie the Captain handed Lieutenant Tillman a sticky-note, then said, "It's a double homicide in the Beverly District. But mind your P & Q's, the victims are federal officials and we will be heavily monitored during this investigation. You can bet that every shred of evidence will be double checked by the Fed's." Inspector Kant scratched his rather balding head and asked, "Why don't they just take the case and save us the hassle?" Then Lieutenant Tillman continued, "That's right, it is not like we don't have enough cases as it is, and someone looking over our shoulder always slows things down; you know that." The Captain replied, "Sorry guys, these orders come from upstairs, so we will just do our jobs and keep our mouths shut. Understood?" The two detectives checked out an unmarked vehicle from the motor-pool and drove to the Beverly District. This area of town is known for its high priced homes and fancy shopping venues. As they entered the Beverly District their vehicle stood out like a skunk in a perfume parlor. Even the gas station attendants smiled as they drove by. The crime took place on a lower level of an underground parking garage. There were several units already on scene when the detectives arrived. Deputy Willard was guarding the perimeter from Look-e-lues and gave the two detectives the run-down when they arrived, "Hay detectives! How have you guys been? I haven't seen you sense the Blanchard Case. What has it been, two, three years?" "At least two, Deputy, at least two," Lieutenant Tillman replied as he looked around. "Where are the bodies?" He questioned. "Over there, in the elevator," the Deputy replied, "the Coroner is there now and the CSI people just arrived." "Were you a first responder Deputy Willard," Lieutenant Tillman asked. Deputy Willard said, "Sure enough, Deputy Marsh and I were responding to a (Shots Fired). The elevator door was wide open so Deputy Marsh covered that while I checked the area to see if the shooter was still on scene. When we entered the elevator we found two adult males down; both appeared to be shot. I checked for a pulse on the one nearest me and Deputy Marsh checked the other. That is when we called in homicide and taped off the crime scene." At that moment Assistant Coroner Martha Bourbon exited the elevator while talking on her cell phone, "I need two ambulances at 17386 Imperial Highway immediately. Yes, two gunshot victims." --- She hung up. Then she drew near to the two detectives, and said, "You homicide people can go to work now, but there are no dead bodies. I guess this is going to be an --- almost homicide. And as for you Deputy, you'd better hope those two victims in there survive, otherwise you and your partner are in a real pickle." The Assistant Coroner turned and walked a short distance away while taking a call on her cell phone; she looked rather agitated. "That's crap," Deputy Willard blurted out, "I've check a hundred bodies and never got it wrong! Besides, Marsh checked a separate body and we both made separate calls. How could both of us get it wrong? Something isn't right here." "I think you're right about that,” Lieutenant Tillman replied, "it does seem rather fishy. Besides, I have heard of similar cases, but they all involved just one person." With that said the two detectives walked toward the elevator. "Ah, my two favorite detective, fancy meeting you here," said Deputy Linda Marsh. Deputy Marsh was helping one of the CSI people with coordination of a particular section of the crime scene. There was light-lasers set-up in an obvious attempt to discover where the shooter was standing, and at what angle the bullets traveled. "Hi Linda, how is Larry and the kids? Inspector Kent replied. "Oh they are all driving me nuts, as usual. But I wouldn't have it any other way," Linda said with a slight laugh. At that moment an ambulances arrived and the attendance raced in to attend to the wounded. A couple of minutes later the other ambulance got there and that attendant joined the race to get the victims to a hospital. "It never ceases to amaze me how regimented and efficient those ambulance people are," Assistant Coroner Bourbon said as she walked towards the detectives. "You have that right?" Deputy Marsh replied. The Coroner said as she patted Inspector Kant on the shoulder, "Well, you guys have fun now," then she told her people to pack up and left. 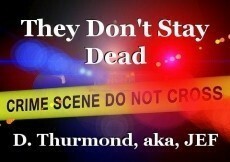 After she left, Inspector Kent asked Deputy Marsh, "What's with the dead, not being dead, thing?" Deputy Marsh replied, "Who knows, we both checked separate bodies and we both made our calls as we saw the situation. I could see one of us making a mistake, but two, --- no way. Those guys were either dead, or their heart rate was so slow that it didn't feel like a heartbeat." The police finished up at the crime scene, CSI went back to their lab, the detectives were sent to another location, a stabbing somewhere in mid-town. As for the Deputies, they were near the end of their shifts, so they returned to the station to write their reports. Assistant Coroner Martha Bourbon walked into the hospital room where the two shooting victims were recuperating. After entering the room she closed the door, looked in the bathroom, and checked the closet. Then she pushed a couple of buttons on her watch and turned her attention to the two men lying in the beds. "How are you two adjusting to these human bodies?" she asked with a slight grin on her otherwise expressionless face. Perfect scary ending. I like it. Thanks, we are working on that. Turned over a new leaf?